This wheeled upright suiter is great for overnight or weekend trips and it's even more lightweight. The in-line skate wheels provide effortless mobility. The large exterior pocket is good for storing shoes or outerwear. And it comes equipped with TSA luggage locks that take the hassle out of travel. On the Outside, this collection comes complete with in-line skate wheels, TSA approved luggage locks and EVA foam backed 1800 Denier that provides a new lightweight design making traveling easier. All these features found through out Samsonite's Aspire Lite collection. Comes in Black, Navy Blue or Moss Green. In the Inside, this piece has room for a suit to hang neatly and virtually wrinkle-free along with folded clothing. There's one zippered pocket on the outside for shoes or additional packing. 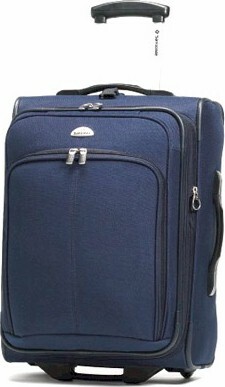 All Samsonite Luggage pricing includes Free domestic shipping and more. Also, no sales tax if shipped to anywhere outside the state of Michigan. On line ordering is of the highest level secure format. We have been in business for over 50 years and offer 30 day Money Back Guarantee. All Samsonite pieces are backed by Manufacturer's Warranty. We also can gold hot stamp your initials at no extra charge, just specify desired initials under "Special Instructions" when placing order.